It’s National Certified Nurses Day! A day to recognize and honor “the important achievement of nursing specialty and sub-specialty certification.” That’s what the website says. 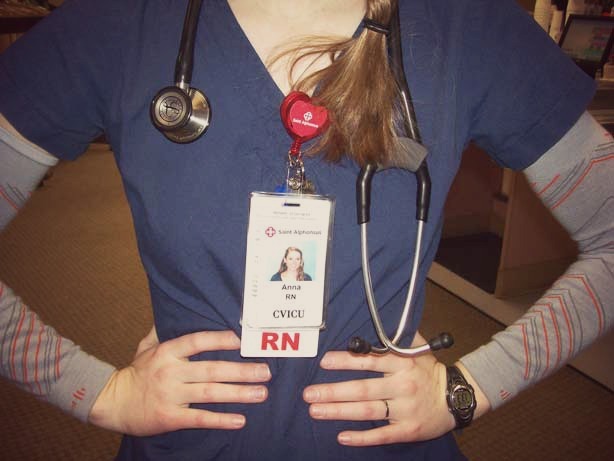 So, in honor of Certified Nurses Day, I thought I’d do a little Question/Answer post to help you learn more about becoming a certified nurse. And since I’m a member of the AACN and my certification was through them, a lot of this will be about my experience with them. Keep in mind, there are a BUNCH of nationally recognized professional organizations who offer certifications. Some of these include: American Association of Critical-Care Nurses (AACN), American Nurses Credentialing Center (ANCC), Cardiovascular Credentialing International (CCI), Emergency Nurses Association (ENA), Society of Gastroenterology Nurses and Associates (SGNA), Center for Improvement in Healthcare Quality (CIHQ), and Oncology Nurses Association (ONA). Q. Don’t you just take the NCLEX and become an RN? What is this nursing certification thing? A. “Certification affirms advanced knowledge, skill, and practice to meet the challenges of modern nursing.” (source) So, you won’t lose your job if you fail a certification test, but it’s an extra something you can add to your registered nurse status. It’s a milestone that not all nurses choose to pursue, but it does recognize personal excellence in a particular area. A. There are a bunch of reasons! You can test your knowledge and be a more confidant nurse in the area you work. If you’re not ready or wanting to go back to school, this gives you something to work towards. It looks great on a resume. The hospital I work for gives a bonus to nurses who become certified, which is awesome. I can sign my name Anna, RN, BSN, PCCN (if I wanted). My hospital also has a ladder system where nurses can level up and having a certification gives you points to go up the ladder. And then you can have celebratory fro-yo after you pass the test. Q. How should I prepare to for the certification test? A. Remember the NCLEX? Sort of like that. -Get study materials. I used the AACN’s PCCN review course online and the audio from David Woodruff’s PCCN review (a friend hooked me up with downloads of his review). I studied for about 3 months. I listened to the review in the car between home and work. I spent a few hours each week reviewing material. I spent the last couple weeks taking practice questions/tests. -Form a study group. While I did not have a study group for my PCCN certification, I DO plan on having one for the CCRN certification! If you do well learning in a group environment where you can talk through ideas and ask questions, it’s smart to do it. If you’re looking for a study group/review course, check with your hospital and with AACN. They have chapters scattered throughout the nation and they will sometimes organize group reviews for certification. This website will help you find an AACN chapter if you’re interested. -Use ALL your resources. Google the certification and see what’s out there. I read through some nursing forums that had suggestions of how people studied and other helpful tips. Youtube the certification. The PCCN, for example, had several videos posted of people doing reviews for the certification and there were questions on the actual test that I got correct BECAUSE I watched those youtube videos! Ask other certified nurses about what they did to study and what they’d recommend to someone preparing to take their test. -Take practice tests! Just like NCLEX. You need to get into the groove of how they ask questions and what they are looking for. -Be confidant. Believe in yourself and believe that you will pass. It helps. -Test day. Know where the testing center is. Don’t be late. Most of the places offer ear plugs, which is nice. I tested at a H&R Block in March, so even though I was in a separate room with the computer, you could still hear customers coming in and talking. Ear plugs made a difference! Also, you find out the SAME day if you pass or fail! That’s something I actually appreciated. Last time I took a test like this, it took 3 days to hear the results. These certification tests can be re-taken. If you don’t pass, they’ll let you know what to do next. Q. Okay, I’m certified. Now what? A. You will have to maintain said certification. For example, mine is renewed every 3 years. I have to maintain my RN license and work so many hours in the area that I’m certified in. Then I need to either take the exam OR complete a certain amount of continuing education recognition points (CERPs). Not so bad, right? I hope this helped a little bit! As a new nurse, I didn’t know much about certification and I probably could have taken this test years ago if I knew more. If you have other questions, leave them in the comments! If you’re on the journey to become certified, good luck! Thank you to all you certified nurses out there! Hey all you nursing students! Landau Uniforms is reaching out to help those aspiring to serve others. Landau uniforms is offering four $2,500 scholarships to current and aspiring nursing students through the Landau “Making Lives Better” Scholarship. From now through April 10th, APPLY for a chance to win a $2,500 scholarship from Landau Uniforms. Let Landau help YOU make a difference! Landau Uniforms has been a leader in healthcare uniform apparel industry for over 50 years. At Landau, making scrubs the right way is the only way we know how to do it. Using only the best materials available from superior fabric to better construction and design, Landau scrubs are simply “Made Better.” To learn more, go to www.landau.com. This is one of those things where you should be thinking, “why not?” Totally take a minute and apply! You don’t win if you don’t play (or something like that). I took a peek at the application and it’s VERY easy and straight forward. You fill out the personal information, you tell them what nursing school you go to (or are about to go to) and then write up a 500-800 word essay on “what excites you most about becoming a nurse.” That’s it! Good luck! Nurses House is a non-profit, nurse-managed organization, ran by a volunteer board of directors. A little history: there was an ACTUAL house in Long Island, NY back in 1922 where sick or exhausted nurses could go for a little R&R. The home was later sold in 1959 and the money was put into a fund that could help nurses in a more practical way- with short-term financial assistance. Nurses can apply for assistance with things like rent or mortgage payments, food, car payments, or health insurance. The organization also help applicants identify other potential resources for assistance. They’ve been able to help thousands of nurses from all 50 states and, in the past 3 years, they’ve helped nearly 300 nurses with grants totaling almost $300,000! You can read some of their inspiring stories here. However, even with these funds, they are only able to help about half of those who apply for their help. Basically, the demand surpasses the supply and there are nurses out there who could use the help. They are holding an online fundraising campaign through the month of October and are teaming up with Dansko to make it awesome! Besides supporting your peers, every person who donates $10 to the cause is entered to win 1 of 7 pairs of shoes donated by Dansko. And speaking of the government, all donations are tax deductible. You can give anonymously, as a gift to somebody, or in memory of someone. And as an extra perk, anyone who submits a donation in my teampage will be entered to win a nursing care package from me! (You’ll like it, promise.) Just leave a comment on this post saying you did it. Why I’m giving: I was lucky enough to find my passion right out of high school. And on the first try too! Most people have to change majors a few times before they figure it out, but nursing just clicked and it’s been a perfect fit for me. I want to support my fellow nurses so they can make it through the hard times and get back to doing what they love. And if you know a nurse who could use some help, tell them about this organization! They are doing something incredible here. We’ve all seen it.The ugly scrubs out there in the nursing world. Maybe you even own some? See, I’m a solid color scrub gal myself. I’m trying to stay opened minded about all these prints but, what I want to know is who is responsible for making such strange patterns on the fabric? Are they made specifically with scrubs in mind? or do people also make curtains with dancing santas on them? If someone has some insight, please share! Link up below and show me what ugly scrubs you found! Come back tomorrow to read about nurses and humor, a symbiotic relationship. Nursing can be an incredibly challenging career at times. This means coping strategies and lots and lots of practice being mentally prepared for your shift, and trying to leave work at work at the end of your shift. Everyone has their own methods. Here’s mine. I wake up at 0525. Then again at 0530. Then once more at 0537. Third time’s the charm and I get up and start getting ready then. Does that make me sound OCD? I think all nurses have their own mild form of OCD. Anyway… back to this post. While I’m getting ready, I usually listen to some of my favorite music on my iphone (while secretly hoping work’s number will pop up and they’ll say the magic “on call” words). Once I’m ready for the day, I leave the bathroom, give Mo a hug & kiss while trying not to wake him too much and leave the bedroom. In the kitchen I gather some food for breakfast and lunch then grab my nursing bag and keys and head out the door. I have a 20 minute drive to work that I can mentally prepare myself for what’s to come: morning rounds with the doctors, open heart surgeries, and distraught families, just to name a few. Some days are worse then others. After a rough day, I take the 20 minute drive home to try and relax. Once again, I usually have music playing that I can sing to. Singing helps me wind down. Once I get home I usually figure out some sort of dinner for Mo and I, then catch up on all the facebook and instagram that I missed over the last 12 hours while I was at work. Sometimes I have roller derby practice. Sometimes I have the next day off, so we stay up late. And by late, I mean 11 or 12. Party animals over here, I tell you what. Once, after an incredibly difficult day, I made chocolate chip cookies. It seemed like the thing to do. Those difficult days tend to stick in your head and you can’t help but think about the circumstances over and over again and think about what you could have done differently and if it would’ve helped… In the end, just giving it a little time helps. Your turn! What is your day like before and after? Feel free to link up with Paige and I! Nursing Tuesday: sitting can kill you. Lately, the only nursing posts I’ve done have been link ups… that’s all fine and dandy, but I’d like to continue sharing little tid bits from the field of medicine, if that’s okay. *This one goes out to all my fellow bloggers. According to this study, excessive sitting is linked to an increased risk of certain cancers, heart disease, diabetes, and other health conditions. Basically, the people who sit the most, die the soonest. They say that even if you exercise, the risk of death still rises in the active people who sat longer. To put it into perspective, the study says that people who sat more than 11 hours a day had a 40% higher risk of dying in the next three years than people who sat less than four hours a day. Yes, there are tons of other factors that could play into this study, but the message I take away is that I need to get up and MOVE. Maybe this seems obvious to you. But when I think about the years I’ve shaved off my life by working night shift and now the hours I’ve spent at the computer writing up posts, reading other’s blogs, responding to e-mails…it makes me want to make some changes. Take frequent breaks from sitting. Get up every 20 minutes or so for a short walk, even as short as 2 minutes. And no, walking to the kitchen to get yourself another bowl of ice cream doesn’t count. #guilty. Paige and I would sure love it. This theme is most apporopriate because today is actually Paige’s Birthday! I’m pretty sure the hospital sent me a birthday card. Then I went home and spent the evening with husband (and the sweet, sweet man bought me a camera)! overall though, the schedule is wonderful and I LOVE only working three 12 hour shifts a week. So, fellow nurse bloggers/readers. Link up below and tell us what it’s like to celebrate a birthday in your neck of the woods! 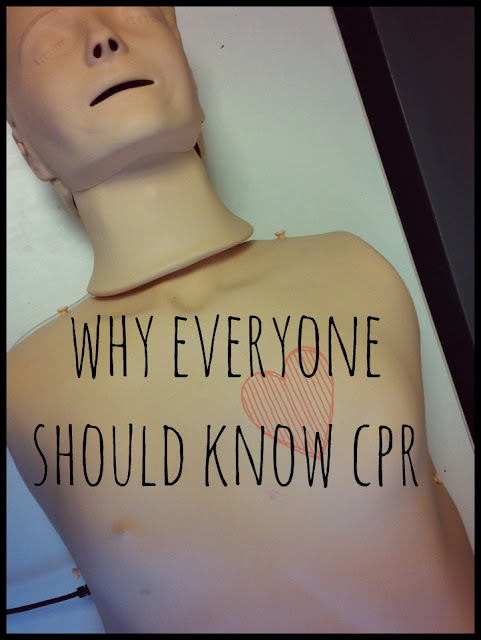 I’ve talked about CPR before. But it’s kind of a big deal, so here I go again. The ability to save lives is kind of like having a super power. a really cool super power that’s a lot more practical than being invisible or controlling the weather. 1. If you know how to do CPR, you can save lives. Obviously. But listen. According to this website, 88% of cardiac arrests occur in the home. And when you consider that a person only has 10 minutes or less until death occurs without CPR, it makes you think, right? It’s comforting to know that, should the worst happen, you can do something about it. 2. If you know how to do CPR, you won’t be surprised when your very first compression creates some popping/cracking noises. See, ribs aren’t meant to bend the way you’re making them bend, but it’s normal. It’s part of the process. It’s going to happen, so it’s best if you aren’t startled when it occurs. I’ve taken care of patients who have survived a code situation and they do complain of their chest hurting from CPR, but they’re alive to complain about it! Besides, we nurses can be generous with our pain meds, so compress away! 3. If you know how to do CPR, you’ll know that it can be a killer ab workout. Working on those manikins can be a workout! But the first time I performed compressions on an adult male in the ER setting, I woke up the next morning with burning abdominal muscles. It’s kind of awesome. 4. If you’ve been trained in CPR, you’ll know that hands-only is an option. An option that I would probably take advantage of if I came across an unconscious person out in the community. In the hospital, we have an assortment of barriers to use so we aren’t doing that ‘mouth-to-mouth’ bit. Unless you’re a friend or family, there’s a good chance I’ll be uncomfortable giving you breaths, so hands only can be a beautiful thing. 5. Even if you know how to do CPR, it doesn’t mean you won’t freeze. Like the time I had my first patient code on me. But once you recover from the shock of it, the training you’ve received will kick in and you’ll be able to use that super power you’ve been saving for a rainy day. 6. If you’ve performed CPR, you’ll know that it doesn’t always work. There are so many factors that have to be taken into account when it comes to saving a person’s life, but CPR is the foundation of it all. Everything else just builds on top of it, and knowing the basics is so important. Consider taking a class. You can even become certified online! Now I just need to get Mo certified. It’s only fair, if I can save his life, he should be able to save mine. 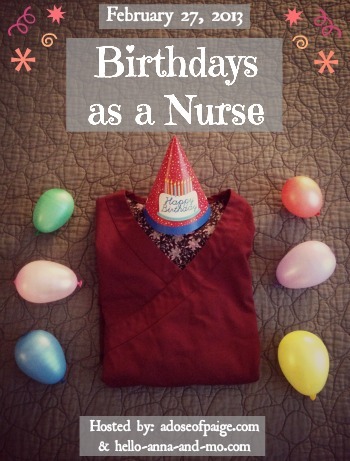 Paige and I are excited to have all you nurse/nursing student bloggers join us and talk about birthdays! It’s an extra special linkup, because the 27th really IS Paige’s birthday! Perfect timing, right? Do you work on your birthday? Or do you try and take it off? Does your unit/hospital/school do anything special for birthdays? On a separate note, I always feel a little sad when a patient of mine has to spend their birthday in the hospital. Sure, they may be 74 and might not want to draw a lot of attention to that fact, but birthdays are and always will be special to me. Our cafeteria is cool and will usually send up a special dessert and a little birthday note if we ask them to. Another time, a couple co-workers decorated a patients room for their birthday: strings of tourniquets and bedpans hanging from the ceiling… it was quite the sight. ps. Here’s the time I made a birthday cake for Florence.